Now you have all the different posts on supplements, all in one place! I put them in order of which ones are most commonly used to treat Down syndrome as well as a couple of categories. You can find another list with lots of info at riverbendds.org. Just click the "Supplements & Drugs" folder on the right. Which Multivitamin for the Down syndrome population? Why L-Carnosine for the T21 Population? This article was recently brought to my attention: Can nutritional supplements help mentally retarded children? An exploratory study. by Harrell RF, Capp RH, Davis DR, Peerless J, and Ravitz LR. Proceedings of the National Academy of Sciences USA, 1981. 78: 574–8. To explore the hypothesis that mental retardations are in part genetotrophic diseases (diseases in which the genetic pattern of the afflicted individual requires an augmented supply of one or more nutrients such that when these nutrients are adequately supplied the disease is ameliorated), we carried out a partially double-blind experiment with 16 retarded children (initial IQs, approximately 17-70) of school age who wee given nutritional supplements or placebos during a period of 8 months. The supplement contained 8 minerals in moderate amounts and 11 vitamins, mostly in relatively large amounts. During the first 4- month period (double-blind) the 5 children who received supplements increased their average IQ by 5.0-9.6, depending on the investigator, whereas the 11 subjects given placebos showed negligible change. The difference between these two groups is statistically significant (P less than 0.05). During the second period, the subjects who had been given placebos in the first study received supplements; they showed an average IQ increase of at least 10.2, a highly significant gain (P less than 0.001). Three of the five subjects who were given supplements for both periods showed additional IQ gains during the second 4 months. Three of four children with Down syndrome gained between 10 and 25 units in IQ and also showed physical changes toward normal. Other evidence suggests that the supplement improved visual acuity in two children and increased growth rates. These results support the hypothesis that mental retardations are in part genetotrophic in origin. Early in 1981, the medical and educational establishments were shaken to their socks. Ruth F. Harrell and colleagues, in Proceedings of the National Academy of Sciences (1), showed that high doses of vitamins improved intelligence and educational performance in learning disabled children, including those with Down syndrome. Though to many observers this seemingly came straight out of left field, Dr. Harrell, who had been investigating vitamin effects on learning for forty years, was not inventing the idea of megavitamin therapy in one paper. But she had at last succeeded in focusing much-needed public attention on the role of nutrition in learning disabilities, a problem that ink-well-era US RDA's and pharmaceuticals by the lunchbox-full have failed to solve. The start of the second World War was breaking news when Ruth Flinn Harrell conducted her first investigations into what she called "superfeeding." Her 1942 Columbia University PhD thesis, "Effect of Added Thiamine on Learning" (2), was published by the university in 1943 and would be followed by "Further Effects of Added Thiamine on Learning and Other Processes" in 1947 (3). Her research was not about enriched or fortified foods; "added" meant "provided by supplement tablets." World War II had just ended when Dr. Harrell stated in a 1946 Journal of Nutrition article (4) that "a liberal thiamine intake improved a number of mental and physical skills of orphanage children." By 1956, Dr. Harrell had investigated "The Effect of Mothers' Diets on the Intelligence of Offspring" (5), finding that "supplementation of the pregnant and lactating mothers' diet by vitamins increased the intelligence quotients of their offspring at three and four years of age." Carbohydrates, including sugar, increase the body's need for thiamine. Children eat a lot of sugar. An unmet increase is effectively the same as a deficiency. This may be part of the mechanism of ADHD and other children's learning and behavior disorders, as many so-called "food faddists" or "health nuts" have proclaimed for decades. Vitamin deficiency can become vitamin dependency. Chronic subclinical beri-beri may result in thiamine dependency in the same way that chronic subclinical pellegra results in niacin dependency. Though these symptoms generally appear after prolonged deficiency, they are very serious and, if untreated, the ultimate result in each case would be death. Practically speaking, a shortage of any one of the B-vitamins can be seen to lead to neurological damage sufficient to contribute to learning and behavioral troubles. Harrell recognized that thiamine and the rest of the vitamins work better as a team. She used two clinically effective but oft-criticized therapeutic nutrition techniques: simultaneous supplementation with many nutrients (the "shotgun" approach), and megadoses. Working on the reasonable assumption that learning disabled children, because of functional deficiencies, might need higher than normal levels of nutrients, she progressed from her initial emphasis on thiamine to later providing a wide variety of supplemental nutrients. The only escape from the inevitability of concluding that vitamin deficiency is a serious factor in learning is the political one: declare a victory. Dodging the issue is as easy as proclaiming that, thanks to food fortification (coupled with a generous portion of wishful thinking), no child has such deficiencies. Though the processed food industry and its apologists continue to assert exactly this, statistics fail to bear this out. An analysis of National Health and Nutrition Examination Survey (NHANES III) data from 1988 to 1994 by Gladys Block, PhD, indicates that over 85 percent of American elementary school-age children fail to eat the recommended five or more daily servings of fruits and vegetables. "NHANES III, a federally sponsored survey shows that on any given day, 45 percent of children eat no fruit, and 20 percent eat less than one serving of vegetables. The average 6 to 11 year-old eats only 3.5 servings of fruits and vegetables each day, achieving only half the recommended 7 servings per day for this age group." (8) Additionally, Dr. Block reports, 20% of children's caloric intake comes from junk snacks, such as soda pop, cookies, and candy. F. Jack Warner, MD, a supporter the Harrell approach (19) writes: "Even today many medical professionals scoff at the validity of Dr. Ruth Harrell's study with nutritional supplements and the important addition of thyroid medication. Dr. Harrell pleaded with her replicators to use exactly the same chemical values of supplements and medications. To date, this still has not been accomplished." (20) In spite of obvious bias, negative "replication" studies using incomplete or low doses are the ones that have been accepted, and Harrell's work shelved. This is saying that the results of inaccurate replication are more valuable than the original successful research. Imagine cloning a sheep, getting a hedgehog, and then claiming that it was the sheep's fault. Incredible. But that is what politicized medical apologetics are capable of. The Harrell study was successful because her team gave learning-disabled kids much larger doses of vitamins than other researchers are inclined to use: over 100 times the adult (not child's) RDA for riboflavin; 37 times the RDA for niacin (given as niacinamide); 40 times the RDA for vitamin E; and 150 times the RDA for thiamine. Supplemental minerals were also given, as was natural dessicated thyroid. Harrell's team achieved results that were statistically significant, some with confidence levels so high that there was less than on chance in a thousand that the results were due to chance (P < 0.001) Simply stated, Ruth Harrell found IQ to be proportional to nutrient dosage. This may simultaneously be the most elementary and also the most controversial mathematical equation in medicine. There is a tone to the controversy that does more than merely suggest that Harrell's research was careless or incompetent. This is unlikely in the extreme; Dr. Harrell, formerly the chairman of the psychology department at Old Dominion University, had been studying children before many of her critics were even born. What is more likely is that Harrell's critics embrace the assumption that medicine must ultimately prove to be the better approach, and if there are any megadoses to be given, they shall be megadoses of pharmaceutical products. Vitamin therapy is unattractive to pharmaceutical companies. There is no money in products that cannot be patented. Children learn at an early age that mud pies don't sell. No investment is made, no research is done where no money is to be recovered. Drug companies do not expect to find, nor do they want to find, a cure that does not involve a drug. A tragic example is modern medicine's approach to Down syndrome. If there is orthodox resistance to using vitamins to enhance student learning, there is positively a fortified roadblock to the suggestion that vitamins can help children with Down syndrome. Nutrition, critics say, can not undo trisomy 21. But nutritional therapy is not a science-fiction attempt to rearrange chromosomes. Nutritional intervention may help the body to biochemically compensate for a genetic handicap. Roger Williams, discoverer of the vitamin pantothenic acid, termed this the "genetotrophic concept." Genetotrophic diseases are "diseases in which the genetic pattern of the afflicted individual requires an augmented supply of one or more nutrients such that when these nutrients are adequately supplied the disease is ameliorated." (1) Ruth Harrell's decades of research showed that it is plausible. Conventional Down syndrome educational material holds that it is hogwash. "Dr. Harrell noted that one of the observations that they made during this study was that when there was a ten point rise in IQ, the family noticed it. When there was a fifteen point rise in IQ, the teachers noticed it. When there was a twenty point rise in IQ, the neighborhood noticed it. "The story of one child is particularly poignant. This seven year old child was still wearing diapers, didn't recognize his parents, and had no speech. His motor skills were relatively unimpaired and he could walk and run fairly well. In forty days, after some of the supplements were increased, his mother telephoned. . . saying, "He's turned on, just like an electric light. He's asking the name of everything. He points and says, 'What zis?' Finally he pointed to his father and said, 'zis?' I said, 'That's your father and you call him daddy, and he looked at him and said 'daddy.' I'm your mother; can you call me mommy?" She went on to say, "I think he saw us for the first time." This little boy went on to do very well in his learning, and eventually tested with an IQ of ninety, which an average IQ." (24) I have seen a beautiful photo in Medical Tribune (9) of Dr. Harrell being hugged by one of the study group children. The kids noticed their own improvement. To date, the orthodox Down authorities' position may be summed up as, there is no evidence that it helps, so do not try it. Dr. Harrell's view would be, there is reason to believe that nutrition might help, so let's see if it does. The first view prevents physician reports. The second generates them. Theorization can only go so far. The proof is in the pudding, and Ruth Flinn Harrell's approach yielded smarter, happier children. Her results are sufficiently compelling justification for a therapeutic trial of orthomolecular supplementation for every learning-impaired child. 1. Harrell RF, Capp RH, Davis DR, Peerless J, and Ravitz LR. Can nutritional supplements help mentally retarded children? An exploratory study. Proc Natl Acad Sci USA, 1981. 78: 574–8. 2. Harrell RF. Effect of added thiamine on learning. NY: Bureau of Publications, Teachers College, Columbia University, 1943. Issued in the series: Contributions to education, no. 877. Reprinted: New York, AMS Press, 1972. ISBN: 0404558771. 3. Harrell RF. Further effects of added thiamine on learning and other processes. NY: Bureau of Publications, Teachers College, Columbia University, 1947. Issued in the series: Contributions to education, no. 928. Reprinted: New York, AMS Press, 1972. ISBN: 040455928X. 4. Harrell RF. Mental response to added thiamine. J Nutrition, 1946. 31:283. 5. Harrell RF, Woodyard E and Gates AI. The effect of mothers' diets on the intelligence of offspring. Also known as: Relation of maternal prenatal diet to intelligence of the offspring. NY: Bureau of Publications, Teachers College, Columbia University, 1956. 7. Garrison RH and Somer E. The Nutrition Desk Reference. New Canaan, CT: Keats, 1990. 8. http://www.eurekalert.org/pub_releases/2002-05/pn-akp051602.php 16 May, 2002. Accessed August, 2003. 9. Winter A. Differential diagnosis of memory dysfunction: Finding the cause when your patient can't remember. http://www.afpafitness.com/articles/Memory.htm Accessed August, 2003. 10. Horwitz N. Vitamins, minerals boost IQ in retarded. Medical Tribune. Vol 22, No 3. Wednesday, 21 January, 1981. Pages 1 and 19. 13. Menolascino FJ, Donaldson JY, Gallagher TF, Golden CJ, Wilson JE, Huth JA, Ludvigsen CW, Gillette DW.) Vitamin supplements and purported learning enhancement in mentally retarded children. J Nutr Sci Vitaminol (Tokyo). 1989 Jun;35(3):181-92. 14. Smith GF, Spiker D, Peterson CP, Cicchetti D, Justine P. Failure of vitamin/mineral supplementation in Down syndrome. Lancet, 1983. 2:41. 15. Weathers C. Effects of nutritional supplementation on IQ and certain other variables associated with Down syndrome. Am J Ment Defic. 1983 Sep;88(2):214-7. 16. Pruess JB, Fewell RR, Bennett FC. Vitamin therapy and children with Down syndrome: a review of research. Except Child. 1989 Jan;55(4):336-41. 17. 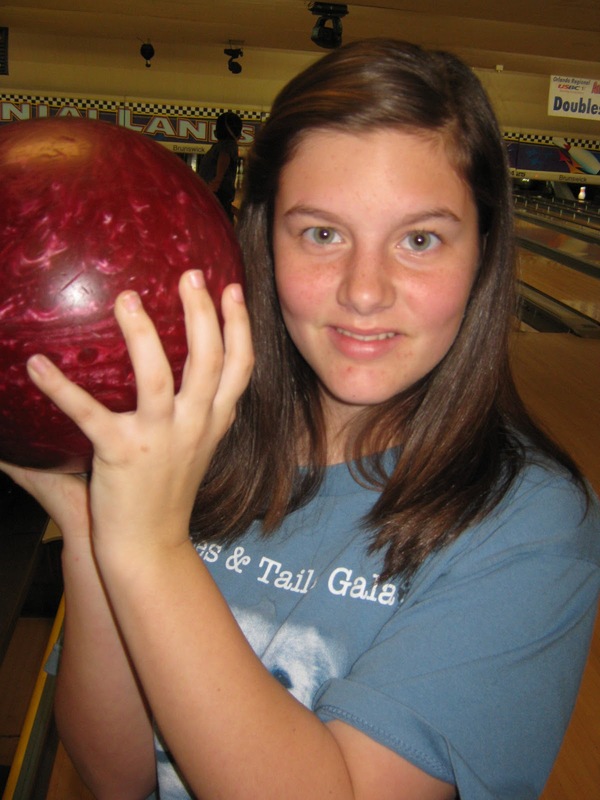 Smith GF, Spiker D, Peterson CP, Cicchetti D, Justine P. Use of megadoses of vitamins with minerals in Down syndrome. J Pediatr. 1984 Aug;105(2):228-34. 18. Davis DR and Capp RH. Vitamins and minerals in Down Syndrome. J Pediatr. 1985 March;106(3):531. 20. Warner FJ. Metabolic supplement for correction of raging free radicals in Trisomy 21: A noncomparative open case study. http://www.warnerhouse.com/radicals.htm . Accessed August, 2003. 21. http://www.ndss.org/content.cfm?fuseaction=SearchLink&article=45 . Accessed August, 2003. 23. Pincheira J, Navarrete MH, de la Torre C, Tapia G, Santos MJ. Effect of vitamin E on chromosomal aberrations in lymphocytes from patients with Down syndrome. Clin Genet. 1999 Mar;55(3):192-7. 24. Craft D. Can nutritional supplements help mentally retarded children? 1998. 25. Davis DR. The Harrell study and seven follow-up studies: A brief review. J Orthomolecular Medicine, 1987. 2:2, 111-115. 26. Turkel H. Medical amelioration of Down's syndrome incorporating the orthomolecular approach. Journal of Orthomolecular Psychiatry, 1975. 4:102-115. 27. Turkel H. The medical treatment for Down's syndrome. Southfield, MI: Ubiotica. 1985. Copyright 2004 and previous years Andrew W. Saul. I first learned about goji berries from Kristen Morrison's book, Naturally Better Kids. She believes that they have been beneficial to her son with T21, Gryffin. They are expensive, but are delicious and most importantly, full of quite an impressive list of health benefits. Fortunately, Jett loves them. He enjoys the frozen, organic type from Whole Foods (when on sale); the dried fruit reconstituted in water; and the juice, first thing every morning mixed with the seven other supplements that he needs to take on an empty stomach (l-tyrosine, l-tryptophan, probiotics, l-orthinine, l-carnosine, bacopa and Nutri-Meds). I've included two articles on the super berries as well as lower priced, organic products I've found. For products, please see the DS Day to Day amazon store. Organic is important, see http://www.suntenglobal.com/news/show.php?ID=138&page for details. Ningxia Wolfberry is the most nutritious goji berry. I purchased the 8 oz dried, raw, organic berries from Whole Foods since it was on sale. The 8 oz. bag has lasted us a long time. I just take a handful and soak it in filtered water in a small baby food jar overnight. Jett didn't like to bite into juicy foods, so I just crush it a little first so it doesn't burst in his mouth. But, now he loves to eat them and asks for them. If you go to vitacost.com, be sure to get $10 off your first order. Goji Berries (sometimes called Wolfberries, scientific name: Lycium barbarum) are a deep-red, dried fruit about the same size as a raisin. The Goji berry tastes somewhat like a cross between a cranberry and a cherry. Out of the 8,000 food-herbs in the systems of Traditional Chinese Medicine and the thousands of years of history that back it, Goji Berries are considered the number one food-herb, with the highest ranking. Super powerhouse in antioxidants. Highest food in antioxidants measured on the Orac Scale. Complete protein source with all 8 essential amino acids. Loaded with 21 trace minerals plus vitamins B1, B2, B6, and E. Regarded as a longevity, strength building and potency food of the highest order. Only fruit known to stimulate growth hormone naturally. What nutrients are found in Goji Berries? Although new to the cuisine of Western culture, the Chinese have known of the special powers of Goji Berries for thousands of years. a complete protein source. They contain 18 different amino acids (on par with bee pollen) and contain all 8 essential amino acids (such as isoleucine and tryptophan). contain up to 21 trace minerals (the main ones being zinc, iron, copper, calcium, germanium, selenium, and phosphorus). contain vitamins B1, B2, B6, and vitamin E.
Mature fruits contain about 11 mg of blood-building iron per 100 grams, beta-sisterol (an anti-inflammatory agent), linoleic acid (an essential fatty acid), anti-aging sesquiterpenoids (cyperone, solavetivone), antioxidant tetraterpenoids (zeaxanthin, physalin), and liver-healing betaine (0.1%). contain polysaccharides which fortify the immune system. About 36% of the sugars found in Goji Berries are polysaccharides. A polysaccharide found in this fruit has been found to be an anti-aging secretagogue. As we age, we produce less and less Human Growth Hormone (HGH). The decreasing levels of HGH have been linked to symptoms of aging. Goji Berries are the only food known to help stimulate the human body to produce more HGH naturally. This factor alone makes the Goji Berry perhaps the world’s greatest anti-aging superfood. some of the highest antioxidant containing foods in the world. Goji Berries typically contain 2-4 times the amount of antioxidants found in blueberries. Goji Berries have been traditionally regarded as a longevity, strength-building, and potency food of the highest order. In several study groups with elderly people several ounces of Goji Berries were given once a day for 3 weeks. Many beneficial results were experienced and 67% of the patients’ T cell transformation functions tripled and the activity of the patients’ white cell interleukin-2 doubled. In addition, the results showed that all the patients experienced an uplifted spirit and more optimism. Appetite improved in 95% of the patients, and 95% of the patients slept better. Betaine, which is used by the liver to produce choline, a compound that calms nervousness, enhances memory, promotes muscle growth, and protects against fatty liver disease. Physalin, which is active against all major types of leukemia. It has also been used as a treatment for hepatitis B.
Solavetivone, a powerful anti-fungal and anti-bacterial compound. Beta-Sitoserol, an anti-inflammatory agent. It has been used to treat sexual impotence and prostate enlargement. It also has a cholesterol lowering effect. The famed Li Qing Yuen, who popularized ginseng in Chinese culture and who apparently lived to the ripe age of 252 years (1678-1930), consumed Goji Berries daily. The life of Li Qing Yuen is the most well-documented case of extreme longevity known. How To Eat Goji Berries? A reasonable daily intake of Goji Berries is 15-45 grams (a handful). Goji berries may be used as snacks or mixed with recipes or smoothies like other dried fruits. Cacao and Goji Berries go particularly well when eaten together. Because of their combined antioxidant content, Cacao and Goji Berries make for excellent airtravel snacks. Organic Goji Berries can be mixed with Sunfood’s Cacao Nibs and/or Sunfood’s Cashews and/or many other dried fruits, nuts, and seeds to make a Goji trail mix. You can blend dried Goji Berries into smoothies, juices, and elixirs. Goji Berries can be soaked and rehydrated in water. The Goji soak water makes for a wonderfully hydrating beverage. This soak water can also be used for the base “stock” of a soup. Goji Berries are an excellent tea additive. Whatever tea you are making, throw 10-15 Goji Berries into the mix and notice how they take the harsh bitter edges off of medicinal herbs and how they accentuate and synergize all the tea ingredients. Try simply drinking Goji Berry Tea all by itself. Lycium Barbarum, commonly known as Goji, grows wild at high elevations throughout much of central Asia and its berries have been used as an herbal remedy by Tibetan and Chinese healers for thousands of years. The plants grow like bushes with vines that reach over 15 feet. The berries are never touched by hand as they will oxidize and turn black if touched while fresh. They are shaken onto mats, then dried in the shade. It is the richest source of carotenoids, including beta carotene (more beta carotene than carrots), of all known foods or plants on earth! Goji is a powerful antioxidant and is traditionally believed to fortify the body against disease and to provide the energy to overcome difficult obstacles in healing. Beta-carotene can be transformed into vitamin A under the influence of human liver enzymes. Being rich in trace minerals, Goji Juice contains significant amounts of zinc, calcium, germanium, selenium and phosphorus, plus small quantities of many others. In Mongolia it is commonly used by first trimester mothers to prevent morning sickness. It is a gentle and soothing fruit that is loaded with available vitality. The Goji berry has absolutely no toxicity. However like most fruits, it should not be used if you are suffering from Spleen deficiency with dampness (This is a Traditional Chinese Medicine term. Basically, hold off if you are congested, have phlegm when you cough or have diarrhea-Andi) and diarrhea. What is Goji juice good for? It is reported to improve eyesight, lower cholesterol, strengthen the immune system, burn fat, build muscles, inhibit tumor growth, promote healthy sleep patterns, relieve the symptoms of menopause, shrink enlarged prostates, alleviate arthritic pain, reverse aging, balance blood sugar, awaken sleeping libidos, and lift sagging spirits. Such wide reaching claims make it sound like the proverbial snake oil. Are these claims for real? Fortunately, a lot of people are trying to find out. In the past few years there has been a fair amount of independent research into the health benefits of goji (visit pubmed.org and search for "lycium barbarum", goji's scientific name). There is also a growing body of anecdotal evidence and testimonials from consumers and health professionals. Goji Juice is now undergoing intense scrutiny as a cancer drug in Tibet, Mongolia, China, Japan and Switzerland. It has been found that the fruit, as well as an extract from its leaves, can kill many kinds of cancer cells in vitro. In vivo studies and human studies are proving to be highly promising. Goji Juice contains approximately 124 ppm of organic Germanium. Germanium has been demonstrated to have anti-cancer activity. Japanese studies indicate that organic Germanium is effective in treating liver cancer, lung cancer, uterine cancer, cervical cancer, and testicular cancer when combined with other drugs. It has been found to induce the production in human beings of g-interferon. Interferon can depress and even kill cancer cells. Germanium possesses the power to take over the hydrogen ion from cancer cells. Losing hydrogen ions can cause depression and even death to cancer cells. Besides Germanium, this berry has other components that act against cancer. These other components appear to be able to depress or block the synthesis of the cancer cells' DNA, which interferes with the cells' ability to divide and thus lowers the reproductive capacity of the cancer cells. Some scientists believe that Goji fruit may be a very good supplement to prevent liver cancer because it exerts liver protection and anticancer effects at the same time. Japanese researchers reported Goji fruits could inhibit the growth of cancer cells. The Goji berry has also been tested as an anti-obesity drug. Patients were given 30 grams each morning and each afternoon, made into a tea. Results were excellent with most patients losing significant weight. Goji Juice is a wonderful and delicious tonic which have traditionally been used as a blood tonic, used to nurture the heart, to relieve heart palpitation, insomnia, forgetfulness and anxiety associated with blood and chi deficiency, especially when combined with chi tonics. During the Tang Dynasty (around 800 AD), a well had been dug beside a wall near a famous Buddhist temple that was covered with Himalayan goji vines. Over the years, countless Goji Berries had fallen into the well. Those who prayed there had the ruddy complexion of good health, and even at the age of eighty they had no white hair and had lost no teeth, simply because they drank the water from the well. The original Goji Juice! From this legend, a Poem was crafted. Imagine -- a tiny berry that contains more beta carotene than CARROTS. Picture this -- a berry that contains more Vitamin C than oranges! Even more amazing -- a berry that contains germanium... unheard of in any fruit! And totally incredible ... the wonderful side effect ... it makes you smile. There are over 34 KNOWN HEALTH BENEFITS provided by this tiny berry which have already been proven in independent scientific studies. 21 Trace Minerals including Germanium (124 ppm), Zinc, copper and iron (Mature fruits contain about 11 mg. of iron per 100 grams) . The 13% Protein is higher than Whole Wheat and displays an insulin like action that is affective in fat decomposition. beta-sitosterol (an anti-inflammatory agent), linoleic acid (a fatty acid), sesquiterpenoids (cyperone, solavetivone), tetraterpenoids (zeaxanthin, physalin), and betaine (0.1%). Truly an incredible food nicknamed the "Happy Berry for Mood"
1) A powerful antioxidant that can help prevent premature aging. 2) Immune System builder. Makes you look and feel younger. 3) Can help maintain healthy blood pressure, and strengthen your heart. 4) Can help improve your memory functions. 5) Can help maintain normal blood sugar level and can help reduce cholesterol. 6) Can help enhance sexual functions and treat sexual dysfunctions. 7) Can help promote weight loss. 8) Can help Relieve headaches and dizziness. 9) Can help Relieve insomnia and improve the quality of sleep. 10) Can help improve your appetite and digestion. 11) Can help maintain eye health and can improve your vision. 12) Traditionally used as a treatment for Cancer. 13) Can help reduce the risk of Cancer and can help inhibit tumor growth. 14) Can help support healthy liver and kidney functions. 15) Can help menopausal symptoms. 16) Can help prevent morning sickness during pregnancy. 17) Can help improve fertility. 18) Can help strengthen your bones and muscles. 20) Can help activate anti-inflammatory enzymes. Many of the legendary health-giving properties of lycium barbarum (goji's Latin name) are today being confirmed in modern scientific studies, and this has led to the possibility of even more far-reaching benefits. • Lycium fruit (Fructus lycii) has significant antioxidant activity. • Lycium fruit contains substances that protect DNA. • Lycium fruit contains polysaccharides that have been demonstrated to potentiate the immune system. • Zeaxanthin, a carotenoid abundant in Lycium fruit, may produce functional improvement in vision. • Lycium fruit has been given to improve sexual function. It was reported that by taking Lycium fruit orally and in the form of an alcohol extract, it could markedly increase androgen levels in the blood, making patients feel more energetic. • Lycium fruit may help athletes produce more lean muscle mass and experience strength gains. • Consumption of Lycium fruit increased SOD levels in the blood. • Consumption of Lycium fruit reduces free radical (lipid peroxide) levels in the blood. • Consumption of Lycium fruit may increase hemoglobin levels. • Lycium fruit has immune potentiating activity. • Lycium as a source of immune-enhancing polysaccharides. The immune system is what keeps your body well. If it is not functioning as well as it should, you get sick when your body cannot fight off an invading illness. When the immune system is overworking, it will turn on you and start killing off healthy cells. Things that weaken the immune system are poor nutrition, lack of exercise, stress, and lack of sleep. These all increase the risk of getting sick. Anti-oxidants such as Vitamin C and Alpha Tocopherol (Vitamin E) are considered to be good for the immune system. The immune strengthening effects of complex sugars called polysaccharides found in Goji are not so commonly known. Polysaccharides are complex sugars, consisting of multiple linked simple sugar (monosaccharide) molecules. They are a glue-like material formed by microorganisms in the process of mineralization, or breaking down organic matter. If it's so powerful, why haven't we heard about the goji berry before now? Great question! For starters, imagine how long it took to find the original strain of berry... next, the need to develop and apply the right technology to find the right berries... and then there is the harvesting itself, which can be a complicated process. The truth is as far back as 1936, British explorer Colonel Reginald Schomberg (1880 - 1958) may have made the original important observation: "...there is such a direct relationship between the sun and fruit. Fruit, more obviously than other foods, ripens and colors in the sun. Sunlight is the carrier of the sun's quality. Through it that quality comes direct from the great orb of our being. It stores itself in sun-bathed food, as in a minor way electricity is stored in a battery. The eating of fruit releases the sun's quality in its most direct and least interfered-with form." The unfortunate thing for Schomberg is that he never presented his theory in a scientific treatise, but merely described it in the notebooks of his Himalayan expeditions. Consequently, his scientific observations went undiscovered for many years until they were recently unearthed. What is the Schomberg effect? Simply put, foods with a high Schomberg effect are said to be able to keep us healthier by facilitating the transfer of energy. When scientists first found, then tested, a variant of Lycium barbarum known as goji, they were astounded. The Schomberg effect measured off the scale. Don't be fooled by inferior berries, or dried goji berries... if you want to experience the FULL EFFECTS of this amazing fruit, you want to be certain it is a juice that matches the optimum potency spectral signature of the original bloodline. In fact, "a one-liter bottle of a good Himalayan-quality goji juice product should provide the polysaccharide equivalent of more than two pounds of fresh goji berries! Gan L, Zhang SH, Liu Q, Xu HB. Institute of Pharmacy, Huazhong University of Science and Technology, Wuhan 430074, People's Republic of China. Luo Q, Yan J, Zhang S.
Department of Hygiene, Hubei Medical University, Wuhan 430071, China. Zhang X. Beijing Military General Hospital. Zhang M, Wang J, Zhang S.
Food Science Department, Huazhong Agricultural University, Wuhan 430070, China. Gong H, Shen P, Jin L, Xing C, Tang F.
Therapeutic effects of Lycium barbarum polysaccharide (LBP) on irradiation or chemotherapy-induced myelosuppressive mice. Cancer Biother Radiopharm. 2005 Apr;20(2):155-62. Zhi F, Zheng W, Chen P, He M.
Zhong Yao Cai. 2004 Dec;27(12):948-50. Chinese. Sytnik E, Komarnytsky I, Gleba Y, Kuchuk N.
Transfer of transformed chloroplasts from Nicotiana tabacum to the Lycium barbarum plants. Cell Biol Int. 2005 Jan;29(1):71-5. Epub 2005 Jan 26. Wu SJ, Ng LT, Lin CC. Antioxidant activities of some common ingredients of traditional chinese medicine, Angelica sinensis, Lycium barbarum and Poria cocos. Hai-Yang G, Ping S, Li JI, Chang-Hong X, Fu T.
Therapeutic effects of Lycium barbarum polysaccharide (LBP) on mitomycin C (MMC)-induced myelosuppressive mice. J Exp Ther Oncol. 2004 Oct;4(3):181-7. Fasting plasma zeaxanthin response to Fructus barbarum L. (wolfberry; Kei Tze) in a food-based human supplementation trial. Br J Nutr. 2005 Jan;93(1):123-30. Since the early 1980s, the Goji (known botanically as Lycium barbarum) has been the subject of a number of clinical studies - including several published by the State Scientific and Technological Commission in China. These studies have documented its antioxidant and immune-stimulating effects. More recent studies in the 1990s have contributed additional scientific support. Role of Lycium barbarum Polysaccharide as an Antioxidant Author: X Zhang Journal: Chung Kuo Chung Yao Tsa Chih 18 (Feb 1993) Location: Beijing Military Hospital, Beijing, China Conclusion: The effect of free radical damage on red blood cells can be prevented and reversed by incubation with either Lycium barbarum polysaccharide or superoxidide dismutase. Abstract: Researchers incubated cells (Xenopus Oocytes) in a solution containing a free-radical-producing system for 6 hours. The changes in the electrical profile of the cell membranes were measured using a microelectrode electrophysiological technique. The results showed that Lycium barbarum polysaccharide both prevented and reversed free radical damage to cells. Protective Action of Lycium barbarum on H2O2-induced Lipid Peroxidation Author: B. Ren, Y. Ma, Y. Shen, B. Gao Journal: Chung Kuo Chung Yao Tsa Chih 20 (May 1995) Location: Faculty of Preventative Medicine, Ningxia Medical College, Yinchuan, China Conclusion: Lycium barbarum protects red blood cell membranes against lipid peroxidation. Abstract: Hydrogen peroxide (H2O2), a powerful promoter of oxidative damage, was used to promote lipid peroxidation of the red blood cell membranes of rats. Dried Lycium berries showed the greatest protective effect against H2O2 damage, followed by Lycium barbarum polysaccharide. Effects of Lycium barbarum and on the Attachment and Growth of Gingival Cells to Root Surfaces Author: B. Liu Journal: Chung Kuo Chung Yao Tsa Chih 27 (May 1992) Location: College of Stomatology, Fourth Medical University, Xian, China Conclusion: Lycium barbarum improved the attachment and growth of human gingival cells to root surfaces. Abstract: A dose of 1.25 mg/ml Lycium barbarum was used to stimulate the in vitro attachment of human gingival fibrobasts to the surfaces of dental roots. In response to Lycium barbarum exposure, cells on diseased root surfaces increased in quantity, exhibited better growth and distribution. Drynaria displayed similar effects but was not as potent as the Lycium barbarum. Effects of Lycium barbarum and Radiation in Treatment of Lung Cancer Author: Lu, C.X., B.Q. Cheng Journal: Chung Hsi I Chieh Ho Tsa Chih 11 (Oct 1991) Location: Cancer Institute, Ningxia Medical College, Yinchuan, China Conclusion: Lycium barbarum enhanced the effects of radiation therapy in the treatment of Lewis Lung cancer. 1. Qi Zongshao, Li Shufang, Wu Jiping, et al. Chemical Analysis on Lycium Barbarum Fruit and Leaves. Zhong Yao Tong Bao (Chinese Herb News). 1986, 11(3):41. 2. Wang Qiang, Chen Suiqing, Zhang Zhehua, et al. The Measurement of Lycium Barbarum Polysaccharide (LBP) in Lycium Barbarum Fruit. Zhong Cao Yao (Chinese Herbs). 1991, 22(2):67. 3. Zhong Guo Shipin Bao (China Food News). March 2, 1998. 4. Data in Rich Nature Nutraceutical Laboratories. 1998. 5. Geng Changshan, Wang Geying, Lin Yongdong, et al. Effects on Mouse Lymphocyte and T Cells from Lycium Barbarum Polysaccaride (LBP). Zhong Cao Yao (Chinese Herbs). 1988,19(7):25. 6. Huang Guifang, Luo Jieying. Immune Boosting Effects from Fu Fang Wu Zi Yang Zong Wan (a Chinese patent herb containing Lycium barbarium fruit). Zhong Cao Yao (Chinese Herbs). 1990, 12(6): 27. 7. Li Wei, Dai Shouzhi, Ma Fu, et al. Active Lymphocyte Effects Observed after Taking Lycium Barbarum Fruits. Zhong Cao Yao (Chinese Herbs). 1991, 22(6): 251. 8. Tao Maoxuan, Zhao Zhongliang. In Vitro Anti-Mutation Effect of Lycium Barbarum Polysaccaride (LBP). Zong Cao Yao (Chinese Herbs). 1992, 23(9):474. 9. Cao GW, Yang WG, Du P. Observation of the Effects of LAK/IL-2 Therapy Combined with Lycium Barbarum Polysaccharides in the Treatment of 75 Cancer Patients. Chunghua Chung Liu Tsa Chih. 1994, Nov.; 16(6): 428-431. 10. Lu CX, Cheng BQ. Radiosensitizing Effects of Lycium Barbarum Polysaccharide of Lewis Lung Cancer. Chung His I chieh Ho Tsa Chih. 1991, Oct.: 11(10): 611-612. 11. Kim HP, Kim SY, Lee EJ, Kim YC. Zeaxanthin Dipalmitate from Lycium Barbarum Has Hepatoprotective Activity. Res. Commun Mol Pathol Pharmacol. 1997, Sep.; (3): 301-314. 12. He Jie, Pan Li, Guo Fuxiang, et al. Hepatoprotective Effects from Lycium Barbarum Fruit in a Mouse Experiment. China Pharmacology and Toxicology. 1993, 7(4): 293. 13. Li yuhao, Deng Xiangchao, Wu Heqing, et al. The Effect on Lipid Metabolism of Injured Liver Cells in Rat. Zhong Guo Zhong Yao Za Zhi (Journal of Chinese Herbal Medicine). 1994, 19(5):300. From time to time, parents express an interest in showing their appreciation for this blog... Well, here's the opportunity you've been waiting for! 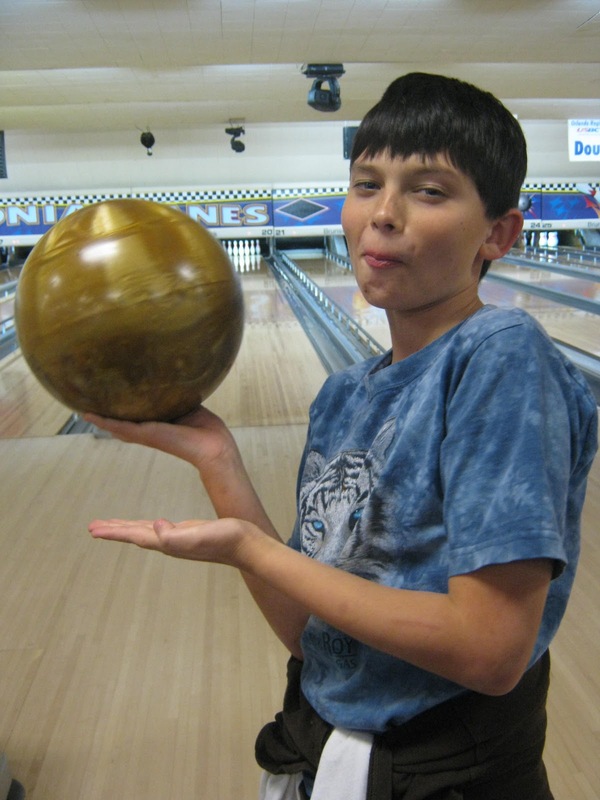 Our local Down Syndrome Foundation of Florida is having their 2nd Annual Tour of Champions Valentine's Bowl-a-thon event this February 12th. The Foundation is all about "striking" Down barriers to inclusion and I'd LOVE for you to sponsor our bowling team, Durkin's Dragons! http://bowlathon.net/event/DSF_Florida_2012/donate. All donations are tax-deductible. 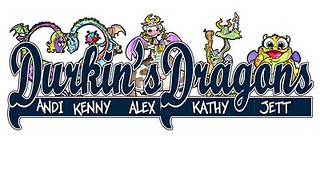 Last year Durkin's Dragons raised over $1,000, and we'd love to do it again this year! Especially since each team that raises over $1000 is eligible to participate in the grand prize drawing for an iPad! Jett would greatly benefit from having an iPad (and maybe have some fun with it too!). As a special incentive, anyone kind enough to donate $50 or more will receive a free caricature of their family (face only, color, drawn in the same style as my blog header). Just type in "We'd love a caricature!" in the comment section when you sponsor us. 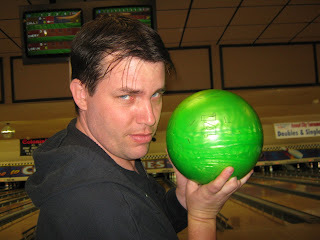 Then email us photos of your family members, along with hair and eye color, to kennydurkin@gmail.com. The Foundation is run 100% by volunteers so all proceeds go directly to families for scholarships and programs! Last year they raised $50,000 -- $34,000 went towards scholarships and $13,000 went towards programs. It is their goal to raise more money this year so they can support the growing number of scholarship requests and implement some additional programs such as Lose The Training Wheels and iCan Work program. Jett has gotten many scholarships from DSFF for his speech therapy evaluations, swimming classes and therapeutic Gymboree classes. 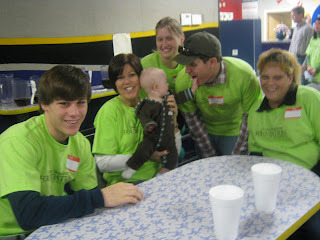 Volunteers, in light green shirts, were there to help the families when needed. Jett was irresistible, as usual, and at one point we had FIVE volunteers "helping" with Jett. Here's Kathy, Jett's sister, and the "Valentine's Day Bowling Ball of Destruction"
Alex, Jett's brother, and "Goldie the Demolisher"
And, Jett's Daddy with "Kermit the Annihilator".